Fake news website YourNewsWire is at it again, blending reality and fiction into a cocktail of scaremongering to attract visitors and clicks. 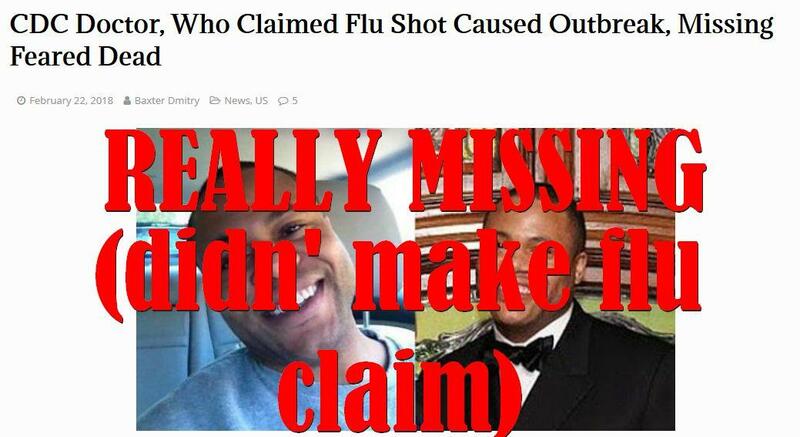 Hot on the heels of their previous runaway viral hit article titled "CDC Doctor: 'Disastrous' Flu Shot Is Causing Deadly Flu Outbreak" (already debunked by Snopes) they published a followup story on February 22nd 2018 titled "CDC Doctor, Who Claimed Flu Shot Caused Outbreak, Missing Feared Dead" (archived here) which falsely claims Dr. Timothy J. Cunningham was the source in the first story and exploits the fact that the real Dr. Cunningham is missing right now. Police are asking the public for help finding a missing Centers for Disease Control and Prevention employee who went home sick 10 days ago and hasn't been seen or heard from since. Timothy Cunningham, 35, went to work on Feb. 12 and left sick, the Atlanta Police Department said. If you happen to have seen him, do call the Atlanta Police Homicide/Adult Missing Persons Unit at 404-546-4235. A CDC doctor has warned this year's "disastrous" flu shot may be responsible for the deadly flu epidemic sweeping the country. "Some of the patients I've administered the flu shot to this year have died," the doctor said, adding "I don't care who you are, this scares the crap out of me." "We have seen people dying across the country of the flu, and one thing nearly all of them have in common is they got the flu shot." Dr. Timothy J. Cunningham, a team lead with CDC's Division of Population Health, has been missing for over a week, according to Atlanta police, with family and police desperate for answers regarding his sudden disappearance. Timothy J. Cunningham, ScD, is a team lead with CDC's Division of Population Health. Dr. Cunningham trained with CDC as an Epidemic Intelligence Service officer. His research has been oriented towards understanding health differences related to race/ethnicity, socioeconomic status, gender, and geography. Dr. Cunningham has also deployed for numerous public health emergencies, including Superstorm Sandy, Ebola, and Zika. He is an active member of the American Public Health Association and the American College of Epidemiology. Dr. Cunningham received his S.M. and Sc.D. from the Harvard T.H. Chan School of Public Health. Notice that "ScD"? That stands for Doctor of Science, which is an academic degree different from a Doctor of Medicine (MD). It is the second type of doctor that people go to for flu shots or prescriptions. The first type doesn't see patients and typically doesn't administer shots so it is higly unlikely he is the source of the first story (which was already suspect to begin with). Other than the claim Cunningham was the source of the previous story the article is just a rehash of the original reporting about the disappearance from 11alive. YourNewsWire has published several hoaxes and fake news articles in the past so anything they write or publish should be taken with a large grain of salt. Their Facebook page "The People's Voice" recently lost its verification checkmark according to a report from MMFA. A while ago we also reported that YourNewsWire had rebranded itself as NewsPunch by changing its domain name in an apparent effort to evade filtering/blocking. It appears the site has changed back to it's old name in the mean time but you can still see the NewsPunch name in the contact email address in the footer. According to news reports there were no signs of foul play.